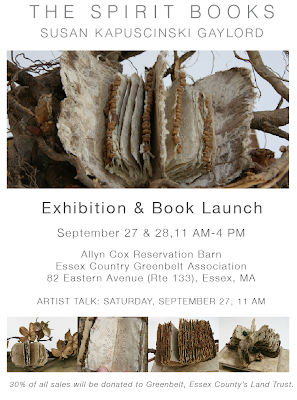 It is just shy of 3 weeks until what has become in my mind "the big event"—The Spirit Books Exhibition and Book Launch on September 27 and 28 in Essex, MA. 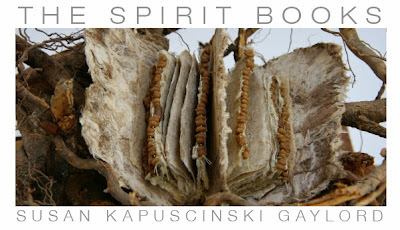 When I think about the fact that my daughter who is just turning 23 was one when I made the first Spirit Book and my son was seven, it makes sense that this is a big deal. I'm trying very hard not to neglect one of the most important (and my least favorite) parts of an event—getting an audience by doing publicity. I've created an online media kit, written and sent press releases, sent emails to school art departments in the area, and printed and am beginning to distribute flyers. I am visiting the host location today for the final planning. I still have signs to make, a price list for the original Spirit Books that will be for sale, simple refreshments to organize, my talk to prepare, and a few Spirit Book bases (and again, my least favorite part) to finish. And all the while I am anxiously awaiting the delivery of the printed books and looking forward to holding one in my hand. If you are in the area, please join me. This is so exciting Susan can't wait to hold your book in my hands!